Volunteers get the front row view of all the fun events! Updated Thursday March 7, 2019 by Beth Jones. Arlington Babe Ruth (ABR) is an all-volunteer baseball league. We count on the support and help of our community to make the baseball experience the best it can be for our players. We need you! Take a look at the opportunities below and see how you can help. To find out more, or to sign up to help, please email Gillyn Croog (gillyn.croog@gmail.com). How YOU can help ABR be the BEST it can be! Managing uniforms for 1100+ players is a Herculean task! Looking for team of folks who is able to oversee the entire uniform process with a committee of helpers. Can you help sort uniforms and help distribute to teams? This will be a March activity, pre-Spring Break. Join ABR in hosting MLB’s Pitch, Hit & Run Competition! This fun event for Arlington boys and girls will take place on Friday, April 6th at Barcroft Park. What is Pitch, Hit & Run? It’s MLB’s skills competition that starts at the local level and advances players to both the district, regional and possibly even national events! Last year Arlington had four players place in the regional competition at Nationals Park! Volunteers are needed for both planning and organizing the event, as well as day of support. The time commitment varies by job, but roughly four hours of prep work and four hours the day of the event. Help support a fun event for all of Arlington’s baseball and softball players! Just a few hours of your time are needed to support the day of the event, helping register players, record scores, and run events. Help coordinate the ordering, sorting and distribution of the end-of-season medals and championship awards. Takes place May and June. Arlington Babe Ruth continues to build a School Liaisons Program to help grow and support ABR in the Arlington community. ABR is actively seeking two volunteers per school community, who can work together in the liaison role. We are looking for volunteers with varying age representation (K-2, 3-5), to ensure we are reaching all possible parent groups. Interested volunteers are asked to serve in the School Liaison position for one calendar year, starting with this Spring season (ending December 2018). Work with ABR Board members and other sports groups in Arlington to help understand activities around field improvement scheduling and advocating for better fields for Arlington youth! There are many meetings and events that occur and we need to have representation at many meetings. Help be a voice for ABR. No need to be at every meeting, but help out when you can. 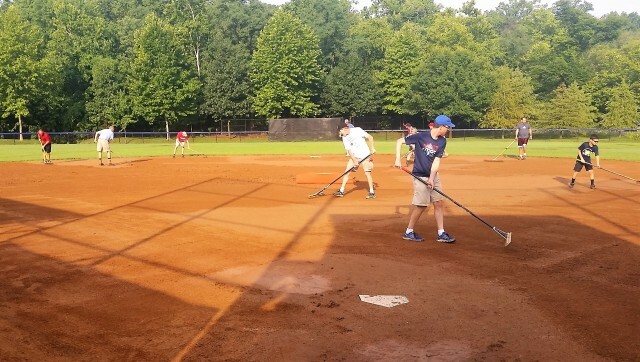 ABR needs volunteers who are willing to be Field Captains to ensure fields are playable each week. Captains will work closely with John Foti and the county to coordinate volunteer efforts, maintenance needs, and evaluating field playability. Field Captains should be those that either live close to that field, or have teams that primarily play on those fields. Arlington Babe Ruth wants volunteers to capture team news and photos for publication on the ABR website, inclusion in the weekly newsletter, posting via Twitter and Facebook, and sharing with local press contacts. Ideally, volunteers from each team would aim to send pics every 1-2 weeks, along with a brief description of the action (including the players, teams and coaches). In addition, ABR encourages team parents to “like” ABR Facebook posts and re-tweet ABR Twitter content. And if you are not following us, please do @ABRarlingtonBB. Arlington Babe Ruth also welcomes help from communications and public affairs professionals who are willing to help with ABR community engagement initiatives on issues such as field advocacy, youth sports funding and efforts to bring baseball to underserved communities. Looking for other ways to help? Ask?!! To find out more, or to sign up to help with one of these fun events and opportunities, please email Gillyn Croog (gillyn.croog@gmail.com).